How many objects that you had as a kid can you find in this delightful puzzle? Bring back good old memories and thrill the entire family with the White Mountain Puzzles – I Had One of Those! Jigsaw Puzzle; a collection of vintage toys assembled in a colorful collage by Charlie Girard. This 1000-piece puzzle features some of the classics like Chatty Cathy, Easy-Bake Oven, Spirograph, Play-Doh, Wooly Willy, Gumby, Beatles, Monopoly, Drive-In Movie, Inchworm, Rock 'Em Sock 'Em Robots, Creepy Crawlers, Slinky and many more. With his seemingly endless supply of ideas and creativity, Charlie Girard has become one of White Mountain Puzzles’ most popular puzzle designers and the creator of fantastic and unique collage puzzles. Art jigsaw puzzles are a fun and inexpensive way to enjoy beautiful works of art first hand. Jigsaw puzzles are also used to boost cognitive skills, develop hand-eye coordination, fine motor skills, problem solving, shape recognition, memory, and task completion. The White Mountain Puzzles – I Had One of Those! includes 1000 unique interlocking pieces made of sturdy blue chipboard on recycled paper. Extra large sized pieces for easy handling. Completed puzzle dimensions: 24 x 30 inches. Every White Mountain Puzzle is proudly manufactured in America with a 100% customer satisfaction guarantee. GOOD OLD MEMORIES: How many objects that you had as a kid can you find in this delightful puzzle? Rediscover a collection of classic toys assembled in the I Had One of Those! puzzle. 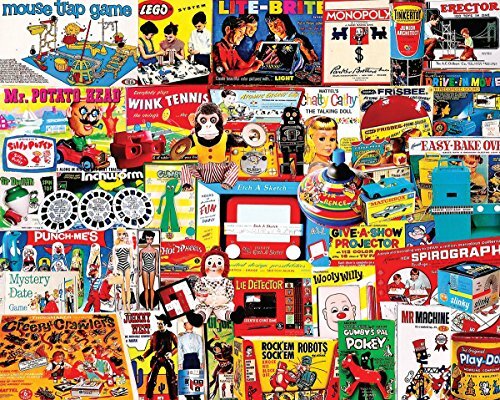 1000 PIECES OF FUN: Featuring a collage of classic toys, this colorful jigsaw puzzle will challenge and thrill the entire family with fun and entertainment everyone can enjoy! ABOUT THE ARTIST: With his seemingly endless supply of ideas and creativity, Charlie Girard is one of our most popular designers and the creator of fantastic and unique collage puzzles. MORE TO PUZZLE BUILDING: Art jigsaw puzzles are a fun, inexpensive way to enjoy works of art first hand. Use to boost valuable motor skills, hand-eye coordination, and problem solving skills. SPECIFICS: Includes 1,000 extra large puzzle pieces made of sturdy blue chipboard on recycled paper. Completed puzzle dimensions: 24 x 30 inches. 100% customer satisfaction guarantee. Made in USA. Publisher: White Mountain Puzzles, Inc. Studio: White Mountain Puzzles, Inc. If you have any questions about this product by White Mountain Puzzles, contact us by completing and submitting the form below. If you are looking for a specif part number, please include it with your message.